The C-Band Alliance (CBA) has announced that as much as 200 MHz of mid-band (C-band downlink) spectrum could be cleared, dependent upon demand, under the organization's updated proposal to the U.S. Federal Communications Commission (FCC) opening new spectrum to support 5G wireless deployment while protecting current users. This updated commitment will be reflected in comment filings due October 29 under the FCC Notice of Proposed Rule Making (NPRM) proceeding. The proposal increases by 80 percent the amount of spectrum that could be made available for 5G terrestrial use as compared to the initial proposal made by Intelsat and SES. The CBA, the entity that will be able to facilitate safe and efficient clearing and repurposing of C-band downlink spectrum, was formed by Intelsat, SES, Eutelsat and Telesat, the leading continental U.S. satellite services operators. According to the Alliance, the group’s proposal is the only one that balances the needs to protect the C-band user community, which includes television and radio programming distribution to more than 100 million U.S. homes, as well as private commercial and government media and data networks with the strong public interest need for rapid 5G network deployment across the U.S. This announcement allows the CBA and members to engage in detailed planning of the complicated task of moving customers to different frequency assignments, facilitated through new satellite capacity and innovative technical solutions, implementing new ground infrastructure and modifying the significant existing infrastructure deployed nationwide. 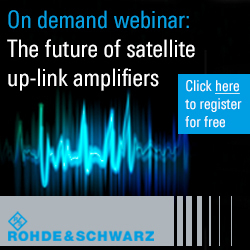 The repurposing of up to 200 MHz of C-band spectrum is contingent upon a number of factors which, at this stage, cannot be guaranteed and their outcome is uncertain, including the following: (i) a final FCC order that accepts the CBA’s market-based proposal; and (ii) a satisfactory market-based process with potential terrestrial 5G users of the repurposed spectrum.